OD: 2 7/8", 3 1/2", 4", 4 1/2", 5",5 1/2",6 5/8". 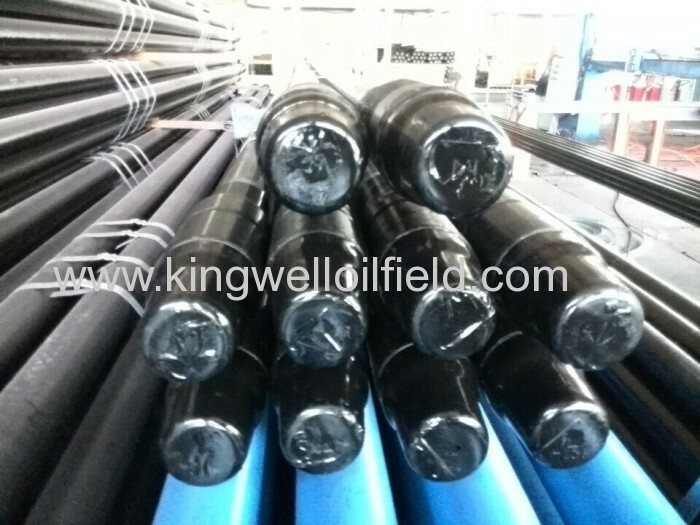 2.Drill pipes are steel tubes with threaded ends that are used to connect a drill rig's surface equipment with its drilling equipment, or bottomhole assembly, at the bottom of a well. They are used to transport drilling fluid to drill bits, and to raise, lower and rotate the bottomhole assembly along with the drill bit. Drill pipes must be manufactured to withstand severe internal and external pressure, distortion, bending and vibration. They are reusable and are not considered consumables in the process of exploring for and extracting oil and gas. 3.Green pipes, raw steel tubes, are processed through a number of steps to make them into drill pipes. First, the walls of green pipes are thickened by a process called "upsetting" through which a pipe's exterior surface is pushed inward. Next, the pipes are threaded and receive a strength-enhancing copper plating. Nondestructive quality control inspection then takes place, after which the pipes are welded to tool joints. Pipes then undergo weld heat treatments and a weld finishing processes that removes welding stress. More tests, including hardness, pressure and non-destructive inspection are carried out on the finished drill pipes before final coating and packaging. 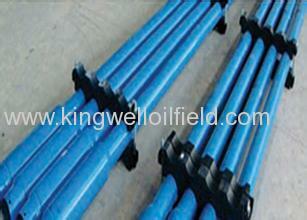 4.The length of drill pipe typically is around nine meters. 5. Our company specialize in producing and selling API standard drill pipe from 2-3/8''OD to 5-1/2'OD.with steel grade G105,S135.We can supply both NC,IF,FH connection type and special connection type as HT55.Mainly used in oil and gas exploration and development process of deep well,horizontal well and extended reach well. XI'AN KINGWELL OILFIELD MACHINERY CO.,LTD (KINGWELL) is a highly reputable supplier for oilfield equipment and services to Oil & Gas industries and provides complete solutions. With over 10 years developing, we were developed from the beginning drilling service to manufacture factory who produce OCTG, drilling tools, DST tools and Solid control products.